The KC series of sealed circular power rocker switches from ZF are single pole switches with single throw operation and an IP rating of IP65. The KC series come with snap in mounts that fit into a standard 20mm diameter cut out for quick installation and have a mechanical life of 100,000 cycles. 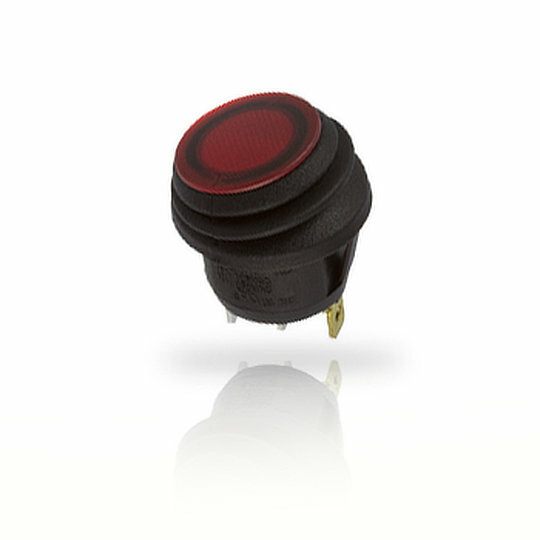 The KC series of sealed circular power rocker switches from ZF are single pole switches with single throw operation and an IP rating of IP65. The KC series come with snap in mounts that fit into a standard 20mm diameter cut out for quick installation and have a mechanical life of 100,000 cycles. Having an electrical rating of 10A at 250VAC/28VDC and 16A at 125VAC/14VDC the KC series is also available with neon or LED illuminated actuator in a variety of colours and o – markings if required. This makes the KC series perfect for applications such as Electronic Appliances, Computer Hardware, Control Panels, Lighting Equipment and Industrial Equipment.